Over the past nine months or so, writer / director Shelley Matulick has been making a documentary about Second Life. 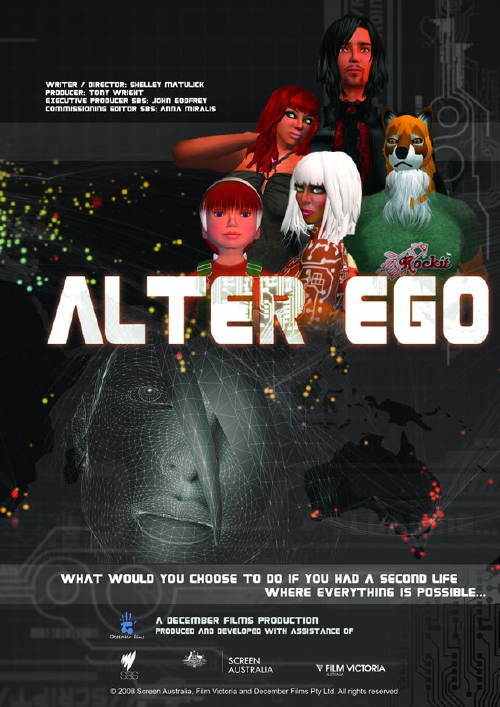 Its working title was CyberStars but the final product has a much improved title of Alter Ego. SBS and Matulick have previously released Our Brilliant Second Life, but the latest production is a significant step up in scope. Stalwart ABC Island admin, Wolfie Rankin, is one of the subjects of Alter Ego and he gives his thoughts on the finished product on his blog. There’s no confirmed release date as yet. This is a documentary that should garner quite a bit of interest, particularly if its portrayals have depth, which seems to be the case on initial impressions. Hi Orval – no news on broadcast date but I do know it's still on the boil.